It almost sounds too good to be true, but there are many resources available to help schools obtain free computers and peripherals to further their students’ education. The computers are donated from various sources such as corporations, businesses, individuals, and government agencies. In fact, it's a win-win situation for all parties when useful donations are efficiently transferred. These programs help donors be socially responsible, engaged in their communities, and in some cases they can even save money donating goods that they may have otherwise had to pay to dispose of. Schools in need get the equipment at little or no cost, allowing them to allocate limited funds elsewhere. Technology donations typically must meet minimum requirement to ensure that they will be useful in their "second life". Depending on how the donations are acquired, they may be delivered in as-is condition or they could come refurbished. In reuse/recycle facilities the computers are typically evaluated for their usefulness and then either scrapped for parts or imaged in preparation for donation to a school or other deserving organization. These centers, however, typically serve their local area. In many cases the school will only incur the cost of shipping the equipment, but it is also important to keep in mind associated costs with preparing the computers for a new life such as software licensing, the cost of personnel to manage the devices, etc. Schools must meet certain criteria to qualify for participation in any of these programs such as applying the donations for specific purposes. Read on as I review a few of these resources as well as highlight other considerations when accepting donated IT equipment. If your school already has charging carts, but they do not charge well or not at all, try the Intelligent Charging System. The Computers for Learning program encourages government agencies to directly transfer surplus computers and peripherals to schools and educational nonprofit agencies. The purpose of the program is to promote equal learning opportunities by better utilizing technology assets that are still useful. Schools that have been approved can select equipment through the ComputersforLearning.gov website. There is no limit to how much equipment can be transferred, although agencies are required to distribute equipment equitably on a national level. Schools interested in this program should keep in mind that the equipment is required to transfer directly from the donating agency to the accepting school. Transfer of ownership from an agency to a reuse/recycle program is not permitted. It is up to the school that accepts the equipment to devise a resource for repairing or upgrading the equipment if needed. Schools utilizing this program will typically incur all associated shipping costs. Schools are required to recycle the equipment in an appropriate manner when it comes time to dispose of it. Most of the donated equipment runs on Windows OS. If your school needs additional equipment, but uses Google Apps for Education there is now a simple solution available. CloudReady enables schools to run Chromium OS on nearly any PC or Mac desktop or notebook/laptop/netbook computer. With this easy-to-install, affordable, software license schools can use donated PC hardware as though it were a Chromebook and it will even make the computers run faster than they would running Windows OS. This can be a cost-effective tool for school districts that wish to implement a 1:1 program with Google Apps and tools by maximizing the value of existing computer hardware. There are several organizations that work to connect donors with institutions in need of goods to further worthy causes. They act as a middle-man, offering tools that make it easier to donate and help those donated goods find an organization in need. Below I will briefly describe a couple of these reputable resources. Cristina Foundation is a well-established facilitator for connecting donors with non-profits, schools, and agencies in need of technology to support education and training programs. Their focus is on serving organizations working with students at risk, people with disabilities, and the economically disadvantaged. Schools that would like to participate must apply to be part of their network. The application process requires a proposal of what the institution plans to do with the equipment including how they will manage the project and how they will benefit. Donors are then able to screen and choose eligible recipients. Good360 is a nonprofit organization that connects companies, charities, and individuals and aids in the effective exchange of many types of donated goods. They help many different types of nonprofits, schools, churches, libraries. Find the resources they are in need of to further their mission-focused programs. Schools may apply to be part of their network online and create a profile highlighting the benefit to their community and specifying their needs. The corporate and business donated goods often come from returns, overstock, clearance, and end-of-season merchandise and must be accepted in “as-is” condition. You may want to consider looking closer to home. 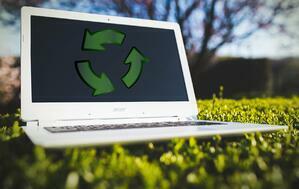 There are many e-waste recycling programs that mostly operate on a local or state-wide level. These organizations rely on computer donations to offer schools free computer grants or deeply discounted refurbished alternatives. Some only operate in a state-wide or regional area. Some will accept requests for equipment from anywhere in the U.S. either with shipping at the cost of the accepting school or under the terms that the equipment must be picked up from the facility within a period of time. Of course, this list is not all inclusive. To find programs like these that may exist near you try searching for "computers for schools" or "free computers for schools" and your state or region. Even though the hardware obtained through these programs may be free, there are still plenty of associated costs. As mentioned, shipping and handling costs are typically incurred and there is still the matter of software licensing. If the computers are accepted in "as is" condition what resources will be used for imaging/refurbishing these devices as needed? Depending on the size of the donation, imaging and installing the new equipment may take a considerable amount of time. What operating system does your school need or prefer? While most will come with Windows OS, some reuse programs set up Linux operating systems as the standard on their refurbished computers. It is possible to run Chromium OS inexpensively on your donated equipment as well. Lastly, but importantly, if you are accepting a donation of mobile devices such as laptops, notebooks, or netbooks, how will you charge and store these devices? You may still need to purchase carts. Additionally, it is especially important to pay attention to the type of charging system in the cart when you are working with older devices as battery life tends to decline over the life of the device. When the devices have a shortened battery life, look for a charging system that will reliably charge the devices in a fast and efficient manner and stop charging when complete to conserve the battery life and increase device availability. Struggling to Integrate Your School's Devices? If you already have devices, but you are finding it hard to integrate them into the classroom, JAR Systems can help by providing affordable solutions that will efficiently charge and manage your devices. Click below to learn more about how JAR Systems can help you achieve successful integration and utilization of your devices. DISCLAIMER: JAR Systems is a cart manufacturer and does not supply schools with devices. This post, however, lists a few of the many resources available to help your schools obtain devices.